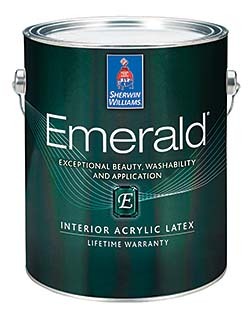 A cleanable true flat finish for the Emerald Interior paint line is designed to hide minor drywall imperfections while providing a rich look. It is intended to offer the same washability, durability, and burnish resistance as the matte and glossier sheens. It also contains anti-microbial agents to inhibit the growth of mold and mildew on the paint surface. Meets stringent VOC regulations and has achieved GREENGUARD Gold Certification.